During the early years of World War II, the existing airfield at Watson Lake was expanded to accommodate the steady stream of fighter aircraft en route from the United States to Russia along the Northwest Staging Route. 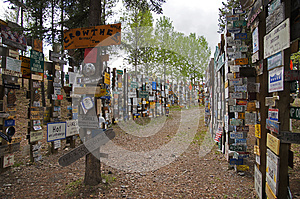 The Signpost Forest may be Watson Lake’s most famous attraction, started in 1942 by Carl Lindley, a homesick GI, while working on the Alaska Highway. He erected a sign pointing to his hometown of Danville, IL. The collection of signs is constantly being added to each year by visitors who wish to promote their own communities. 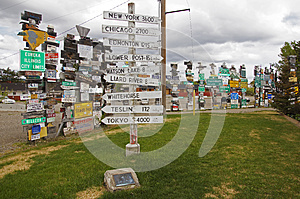 The Town of Watson Lake maintains the Sign Post Forest which is known as one of The Yukon’s most famous landmarks with over 72,000 unique signs. Watson Lake is the first Yukon community encountered by the northbound traveler and is the second largest town in the Yukon. It is a comfortable day’s drive from Fort Nelson or Whitehorse. Watson Lake is a popular stopover point, it has several hotels, campgrounds, service centers and a heated swimming pool that is open in the summer. In 1898, 14 year old Francis (Frank) Gilbert Watson, an American from Lake Tahoe, came to the Yukon with his father Robert Montgomery Watson. 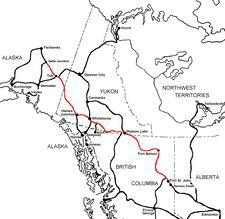 They traveled the Chilkoot Trail route to Dawson City and had a successful Gold Mine in the Klondike. Unfortunately, like many other gold miners of the day their mine was flooded out in 1905 and Frank & Robert decided to return home to Lake Tahoe. A few years later Frank returned to The Yukon through Wrangell, Alaska and the Stikine and Dease Rivers. 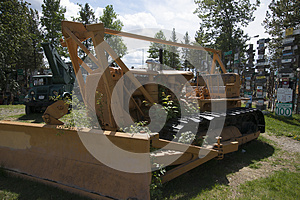 This brought him to the Liard River Valley near what is now the Town of Watson Lake. 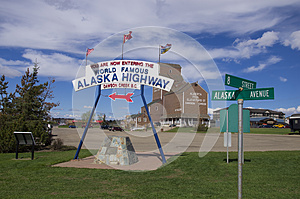 It was here he met Adela Stone, a formidable & well-known Kaska woman. Because of Frank’s relationship with Adela, the Kaska people allowed Frank to trap, prospect and settle in the area. Frank and Adela Watson have long been recognized as key figures in the early development in this part of the Yukon. Watson Lake grew from a small isolated outpost to a thriving community when the Alaska Highway was routed through its center. 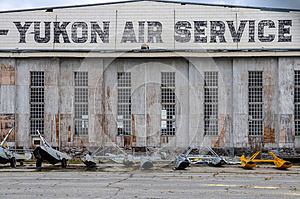 It was the accommodation and supply center for the building of this section of the highway. In 1942 Watson Lake became an important transportation hub and is still the communication and distribution center for the Southern Yukon. Watson Lake Public Campground on Alaska Highway north of Watson Lake 3 km/2 mile side road. 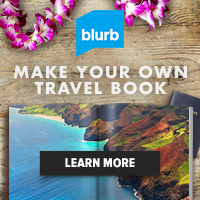 55 camp sites with 12 pull through sites, water, picnic shelters, toilets, firepits, hiking trails. Fee area. This is one of only three commerical RV Parks were I stay while traveling on the Alaska Highway. They are close to Whitehorse, have free wireless internet, and really great discounts on fuel and propane for those that stay in the park overnight. Very customer pleasing. The bathrooms here are lovely and airy; spacious showers have wooden benches. Campsites are next to one another in an open gravel area which has trees at the perimeter. This campground is right in the centre of Watson Lake. There is a pet walkin area. In Watson Lake, north off highway 97 (main road).